The Purge Closed Purchase Orders function deletes fully received, invoiced, or canceled orders. Those Purchase Orders that maintain an order status set of C, may also be deleted by this application. You may optionally delete orders that are not formally closed (have not had their order status changed to C), but which are eligible to be closed. This application also allows the deletion of disapproved orders that were never printed. During the deletion process, the program posts historical information about the order to the Vendor file and the Purchase Line History file. This information is later accessed to produce the Vendor Performance Analysis Report and the Purchase Line History Report. Enter the range of order numbers to be considered for deletion and other pertinent information. 5. Delete Open Orders Eligible for Closure ? Answer Y if you wish the program to automatically delete orders for which all line items are either canceled, fully received and invoiced, or fully received and the Close PO's Not Fully Invoiced Flag in P/O Setup is Y. If the order is qualified to have its status set to C, it will be selected for deletion when you answer Y. Answer N if you do not wish the program to delete such orders. 6. Delete Open Orders Not Yet Printed ? 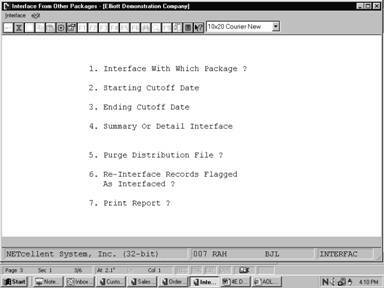 Answer Y if you wish the program to automatically delete orders with a status of U or R. This capability enables you to delete orders that were entered but which were not approved for release and consequently have never been printed. You must be careful to enter a range of order numbers and date, in such a manner that you will not inadvertently delete valid orders that simply have not been printed yet. Answer N if you do not wish to have such orders deleted.